Added a new page that documents three routines added in NCL V6.6.0 for calculating interpolations and cross-sections of WRF-ARW 2D and 3D fields using lines and planes as slices. Added a page of NCL-to-Python examples, which serve as a companion to the NCL to Python Transition Guide, both developed by Karin Meier-Fleischer of DKRZ. Added example goes_6.ncl showing how to plot GOES-16 data. Added a new application page for showing various ways to zoom in on WRF map plots. Added a new application page for drawing data locations as lines or grids on an existing plot. Added a new application page for customizing WRF titles. Added example shapefiles_21.ncl showing how to mask data based on shapefile outlines, using two different methods. Added a new page that describes the basic concepts behind plotting data on a map using NCL. Added examples polyg_19.ncl and polyg_2.ncl showing how to add maps as annotations of other maps. Added example bar_19.ncl showing how to force bars s to be the same width in a series of bar plots. Added examples "mask_14.ncl" and "mask_15.ncl" to the mask examples page showing how to use masking to show areas of interest. Added examples "panel_36.ncl" and "panel_vp_36.ncl" to the panel examples page showing how to panel plots with a mix of individual and common labelbars. Added example "panel_37.ncl" to the panel examples page showing how to panel 4 rows and 3 columns of plots, with each row having its own vertical labelbar. Added example "lcnative_latlon_1.ncl" showing how to draw native lambert conformal data on a different map projection. Added a new page that describes how to write CSV (comma-separated values) files. Added example (conLab_8) to show how to format contour line labels and labelbar labels. Added example "text_19.ncl" to the text examples page, showing how to draw curved text on a map. Added example "interp1d_2.ncl" to the interpolators for one-dimensional curves page, showing how to apply different tension values to get different smoothed effects with ftcurv. Added an animation example showing how to speed up the creation of individual plots in an animation by using "setvalues". Added another NCL editor enhancement for the Atom editor, contributed by Ryan Pavlick of the Jet Propulsion Laboratory. This one allows users to run an NCL script or a selection from an NCL script directly from their Atom editor. Added colormap example 10 which draws all of the NCL colormaps as vertical labelbars. Added a link to an NCL editor enhancement for the Atom editor. This was contributed by Ryan Pavlick of the Jet Propulsion Laboratory. Added example "mapoutlines_5_zoom.ncl" to the map outlines page comparing various map resolutions available in NCL, with high resolution outlines from a shapefile. Added example "axes_6.ncl" to the axes page showing how to increase the range of the X and/or Y axis when you have coordinate array assigned. Added example "overlay_12.ncl" to the overlay page showing how to overlay two color contour plots each with their own color map. Added a link to another NCL editor enhancement for the Notepad++ editor. This was contributed by Dr. Ma Xinye and Ge Hui, from the School of Atmospherical Sciences, Nanjing University, China (worldwindmxy@gmail.com). Added example "overlay_11.ncl" to the overlay page showing how to overlay vectors and filled contours on a map, with the contours masked by China and Taiwan. Added example "text_18.ncl" to the text page showing how to add multiple figures to plots in a panel plot. Added an animation example contributed by Karin Meier-Fleischer of DKRZ showing how to animate two globes side-by-side. Added example stream_10.ncl to the streamlines example page showing how to panel colored streamline plots with a common labelbar. Added example stream_11.ncl showing how to color streamlines based on a scalar field. 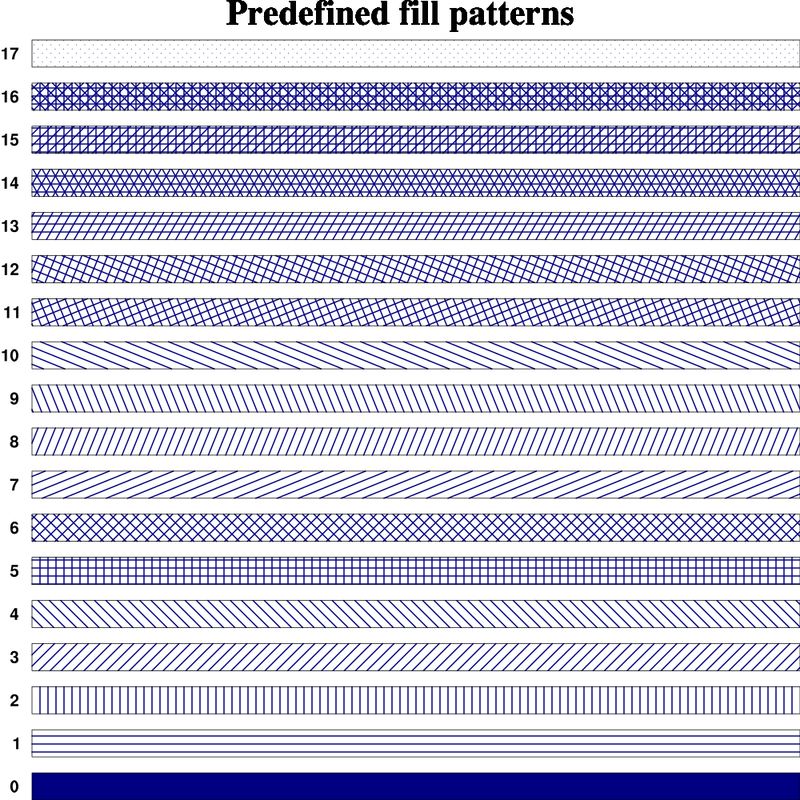 Alan Brammer of the University of Albany contributed the initial version of the above examples and the code necessary to produce scalar and paneled streamlines plots. Added ESMF example ESMF_regrid_31.ncl to the ESMF regridding page showing how to regrid data from a categorical vegetation data to a 1 degree using nearest neighbor interpolation. Added ESMF example ESMF_regrid_32.ncl to the ESMF regridding page showing how to regrid data on a WRF output file to both a 1.0 and 0.5 degree grid, with lat/lon lines included to show the grid structure. Added WRF example wrf_gsn_7.ncl to the WRF/GSN page showing how to regrid data on a WRF output file to both a 0.25 and 0.125 degree grid, with lat/lon lines included to show the grid structure. Added three Butterworth filter examples (bfband_[1-3].ncl) to the filters example page. These illustrate the use of the new dim_bfband_n function that will be added to NCL V6.3.0. Added examples cloudsat_2.ncl and cloudsat_3.ncl to the CloudSat page. Added examples "shapefiles_17.ncl" and "shapefiles_18.ncl" the Shapefiles page showing other methods for masking data based on outlines in a shapefile. Added an example of reading and plotting CO Total Column from an HDF-EOS5 MOP02T-20100414-L2V16.2.1.he5 file, using colored markers. This script was contributed by Rebecca Buchholz, NCAR/ACD. Added example "shapefiles_16.ncl" to the Shapefiles page showing how masking against a shapefile outline affects different grid resolutions. Added a new applications page showing how to plot WRF-ARW data using gsn_csm plotting scripts. Added a unique panel plot with four sets of filled curves, contributed by Dustin Swales of NOAA/PSD. Added a link to an NCL editor enhancement for the Notepad++ editor. This was contributed by Brian Vanderwende, a PhD student at the University of Colorado Boulder. Added an example showing how to attach a logo to an existing NCL plot. See logo_4.ncl on the Logos example page. Added some faster and cell-fill versions of scripts for plotting MPAS data. Added some "France" examples in the shapefiles page showing the use of the new gsSegments and gsColors, and how the gsn_add_shapefile_polygons and gsn_add_shapefile_polylines routines have been sped up. Added some faster versions of scripts for plotting ICON data. Added example "bar_18.ncl" to the bar chart page showing how draw stacked bars with labelbars. This was contributed by Rashed Mahmood. Added an example to the unique page showing how to compare wind fields. This script was contributed by Clément Vic, PhD student at Laboratoire de Physique des Océans, Brest (FRANCE). Added example "Germany_coastal_counties_DEU_adm.ncl" to the Shapefiles page showing how to use shapefile outlines of coastal counties in Germany to average data over each county. This example was contributed by Karin Meier-Fleischer of DKRZ. Overhauled the Shapefiles examples to use newer methods for attaching shapefile data to an NCL map. Also included a new and more generic "shapefile_mask_data" function in shapefile_mask_data.ncl for masking data based on outlines in a shapefile. Added example "shapefiles_14_mask.ncl" to the Shapefiles page showing how to mask WRF data based on outlines in a shapefile. Added example "bar_17.ncl" to the bar chart page showing how fill bars to the left and right of a given X reference line. Added example "bar_16.ncl" to the bar chart page showing how to create a basic stacked bar plot. This was contributed by Rashed Mahmood. Added a link to an NCL editor enhancement for the Sublime Text editor. This was contributed by Dr. Li Dong of IASP/Chinese Academy of Sciences. Added example "shapefiles_14.ncl" to the shapefiles page showing how to add shapefile outlines to an existing WRF contour/map plot. Added example "text_17.ncl" to the text page. Added example "contour1d_4.ncl" to the contour1d page showing how to color markers based on the same levels used in a contour plot. Opacity is used to de-emphasis the filled contour plot. Added example "overlay_9a.ncl" to the overlay page showing how to use overlay to overlay two plots that are in different data spaces. Added example "zonal_8.ncl" to the zonal means page showing how to add an additional curve to the zonal means plot. Added example "wrf_debug_4.ncl" to the WRF debug page showing two ways you can subset a WRF lat/lon grid. Added example "shapefiles_13.ncl" to the shapefiles page showing how to take the average of a data array based on Georgia county outlines read from a shapefile. Added example "panel_33.ncl" to the panel page showing how to maximize two sets of paneled plots. There are other examples that show how to do this, but this one also has vertical labelbars and uses the new cnFillPalette resource to assign different color maps to each set of contour plots. Added example 17 to the "new color capabilities" page showing how to use opacity to highlight overlapping positive and negative contours in two separate plots. Added example 27 to the ESMF regridding page showing how to regrid data from an ECMWF operational Gaussian grid to 2.5 degree grid. Overhauled the "Writing ASCII files", "Writing binary files", and "Reading binary files" example pages to add more examples and clean them up. Added a new application page for examining WRF grids. Added example "panel_31.ncl" to the panel page showing how to panel vectors over topographic maps, with a single vector reference annotation box drawn at the bottom. Added example "panel_32.ncl" to the panel page showing how to panel spaghetti plots and add a custom legend. Added a new application page for creating topographic maps. Added example "panel_30.ncl" to the panel page showing how overlay bar charts on maps, and then to panel them with no white space inbetween the maps. Added example "conLev_4.ncl" to the contour levels page showing how to deal with contouring constant fields. Added example "raster_6.ncl" to the raster page showing how to create a 2D histogram with irregular X and Y axes using raster contours. Added example "shapefiles_12.ncl" to the shapefiles page showing how to modify the gsn_add_shapefile_polylines routine to limit what polylines are drawn. Added example "panel_29.ncl" to the panel page showing how to panel multiple plots with both color and shaded contours, and create two separate labelbars. Added example "xy_32.ncl" to the XY plot page showing how to create multiple legends for a multi-curve plot. Added example "overlay_10.ncl" to the overlay page showing how to overlay shaded contours on filled contours, with two separate labelbars. Added example "shapefiles_11.ncl" to the shapefiles page showing how to use a shapefile containing U.S. outlines to create a land mask. Added a new application page for visualizing MPAS model data. Added a new application page for visualizing COSMO model data. Oliver Führer from MeteoSwiss provided the scripts and information for this page. Added three new examples to the unique page: schematic map of the Arabian Sea, a quiver plot, and a bathymetry plot. These scripts were contributed by Clément Vic and Nicolas Barrier, PhD students at Laboratoire de Physique des Océans, Brest (FRANCE). Added two new examples to the RGBA color page: using the relatively new cn*Palette* resources and using opacity values for a filled XY plot. Added a new example to the pie chart page showing how to draw pie charts over a map. This example was contributed by Zheng Lu of EAS, Georgia Tech. Added a new application page for analyzing data from the IBTrACS project. Added example 3 to the time axis labels page showing how to create a time series of WRF data, with nice time labels on the X axis. Added example 15 to the bar chart page showing how to draw filled bars under an XY curve. Added example 10 to the shapefiles page showing how fill shapefile polygons based on a provided colormap. Added example 20 to the labelbars page showing how to draw several labelbars on a page. Updated example "station_2.ncl" on the station page to add a second plot that draws a labelbar instead of a legend. Added example 24 to the ESMF regridding page showing how to regrid data from a POP grid to 1x1 degree grid. Added example 8 to the overlay page showing how to overlay an XY plot on a contour plot. Examples 12 and 13 were added to the mask applications page showing how to create a land mask from a shapefile that contains coastal outlines. Example 13 compares the mask with one read off the data file. Added example 10 to the annotation page showing how fill in the background of small XY plots that overlap with a larger XY plot. Added a new page showing how to plot data from various Toulouse models. These scripts came out of two NCL workshops held at CERFACS in Toulouse in October 2012, using datasets provided by the students. Added example 9 to the annotation page showing how add small XY plots to the inside of a large XY plot. To see a real-world example of the same technique, see example 13 on the "unique plots" page. Added example 27 to the map only page showing how to draw a map in four quadrants, with each quadrant using a different fill color. Example 7 was added to the Lat/lon grid lines on a map applications page showing how to draw a WRF lat/lon grid. Added example 28 to the panel plot page showing how to panel 60 plots with slightly different sizes, and move them closer together. Added example 20 to the ESMF regridding page showing how to regrid data from a 27km WRF grid to a coarser 81km WRF grid. Added example 9 to the shapefiles page showing how to calculate an areally weighted mean time series for an irregularly shaped region. 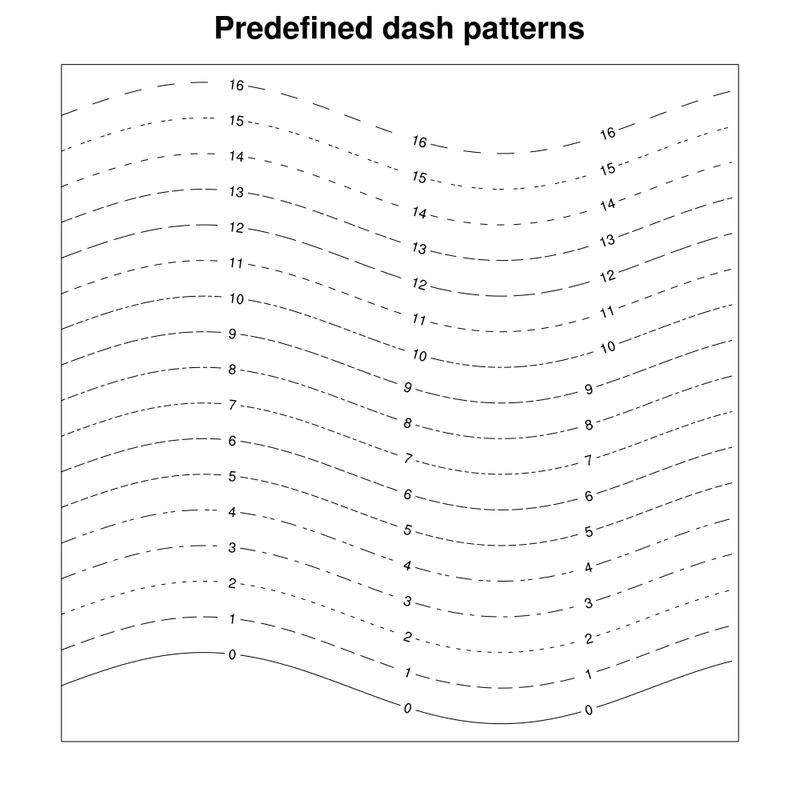 Added example 31 to the XY page showing how to create your own dash patterns for an XY plot. This can be useful if you need to create dash lines with more spaces between the dashes. Added example 4 to the local minima/maxima applications page showing how to add different color markers to a plot that uses a 256-color colormap. Added example 19 to the labelbar page showing how to reconstruct a labelbar from contour plot, in the exact location as it appears with the plot. Added new applications page for plotting Ocean Product Suite (v7) data. Added example cpcuni_1.ncl to the high-res precipitation applications page showing how to plot CPC_unified for a specific file. Added example 6 to the table applications page showing how to draw a plot of filled triangles. Added example 6 to the equations applications page showing the formal definition of liquid water path as shown in the AMS glossary. Added a new page that describes how to plot Global Precipitation Climatology Project data. Added example 18 to the labelbar page to show how to draw an outer box only around the labelbar boxes. Added a new page that describes how to plot GOES satellite data. Added a new page that describes how to do simple Fourier analyses of climate data. Added examples 18 and 19 to the ESMF regridding page to show how to regrid data on a HOMME grid. Example 6 was added to the Lat/lon grid lines on map applications page showing how to add latitude labels. Added a new page that describes how to handle atmospheric and oceanographic climate indices. Example 14 was added to the legend page showing how to draw only a partial legend for a plot with several XY curves. Example 9 was added to the taylor diagram applications page showing how use taylor diagrams for many models. Thanks to Erik Noble of NASA for the contribution. Example 5 was added to the Evans Plot applications page showing how to panel several Evans plots. Thanks to Dr. Jason Evans of the Climate Change Research Center at the University of New South Wales for providing the updated template and new example. Example 2 was added to the animation applications page showing how to created an animated GIF of WRF contour data. Examples 7 and 8 were added to the annotation applications page showing how to draw multiple plots around a single plot, and then draw connector lines between them. Example 14 was added to the bar applications page showing how to draw a curve on top of a bar chart. Added a new page that describes how to draw phased contours. Example 9 was added to the colormap page showing how to create a color map that reverses the colors at midpoint. Example 16 was added to the text page showing how to line up decimal points in floating point text strings. Example 3 was added to the local minima/maxima page showing how to label your own minima/maxima locations. Added a new page that describes how to handle complex coefficients in GRIB files. Example 7 was added to the vector plots page showing how to change the position of the arrow with respect to the base coordinates. Example 13 was added to the legend page showing how to create a legend from scratch using an XY plot. The purpose of this is to allow you to further customize the legend, say by removing one or more of the legend items. Example 13 was added to the bar chart page showing another variation on "floating" bars. This example shows one way you might compare data from different models. This example was contributed by Daniel Adriaansen of NCAR/RAL. Example 12 was added on the unique applications page to show how to plot a PIREP/METASR/RAOB combo. Added a new ASCII reading example that reads a complicated ASCII file with no delimeters or much structure. Added a new page that describes how to plot data on a rotated lat-lon grid. Added a new Kate editor enhancement for NCL contributed by Raul Valenzuela of the University of Colorado. Examples 4 and 5 was added to the Wind barbs page showing how to use wmbarb to create a wind profile plot. Example 5 was added to the radar page showing how to use raster contours to create a panel of four different radar plots. This example was contributed by Qin Rui of the Beijing Weather Modification Office. Added example 17 to the labelbar page showing how to draw a plot with a labelbar with triangular ends. Added example 7 to the scatter plots page showing how to draw big hollow markers and use labelbars, markers, and text strings to create a nice legend. Added example 25 to the maps only page showing how to fill the climate divisions in the state of Idaho. Added example 16 to the labelbar page showing how draw a labelbar with triangular edges. Added example 15 to the labelbar page showing how to reverse a labelbar. Added example 12 to the bar chart page showing how to draw multiple sets of "floating" bars. Added example 27 to the panel plot page showing how draw both a vertical and horizontal labelbar on a panel plot. Added example 26 to the panel plot page showing how put multiple paneled plots on one page, using different colormaps. Added example 4 to the CESM Ice Model page showing how to visualize data on the CICE tripole grid. Added a new Aquamacs editor enhancement for NCL contributed by Luis C. Cana Cascallar. Added a new page that describes how to customize to lat/lon grid lines over a map. Example 8 was added to the Shapefiles applications page showing how to draw various administrative areas for India. Example 3 was added to the coastlines applications page comparing NCL's and RANGS/GSHHS map databases with shapefile data for Australia. Added a new page that describes how to set contour levels for use with symmetric color tables. Example 8 was added to the Taylor Diagram applications page showing how indicate bias on the diagram. Example 6 was added to the annotation applications page showing how to attach plots to the outside of a map. Example 7 was added to the shapefiles applications page showing how to plot river basins, indigenous areas, places of interest in Australia. Example 4 was added to the radar page showing a nice way to display radar data with special labels. Example 10 was added to the bar plot page showing how to draw horizontal stacked bars. Examples 2 and 3 were added to the radar page showing more ways to display radar data. Example 6 was added to the scatter page showing how to draw filled, outlined dots on a polar map projection. Example 12 was added to the legend page showing how to further customize an XY plot legend. Example 14 was added to the labelbar page showing how to change the alignment of labels on a labelbar. Example 4 was added to the masked Lambert Conformal page showing how to add lat/lon labels to the map. Example 5 was added to the raster contour page showing how to get full-sized raster contours at the boundaries. Example 10 was added to the masking applications page showing how to mask missing values in a cell-filled contour plot. Example 30 was added to the XY plots page showing how to force an axis to be irregularly spaced. Example 24 was added to the map only page showing how to add minor tickmarks to a map. Added new page that describes how to create opaque or transparent plots. Example 4 was added to the axes page showing how to create a cartesian coordinate system. A new page that describes how to read CSV files was added. Added example 9 to the map tickmarks page to show how to create your own map tickmarks for any rectangular map projection. Added example 4 to the POP Grid to Lat/Lon Grid to illustrate how to reduce errors along coastlines when regridding from a POP grid to a lat/lon grid at depth. Added example 13 to the polygons, polymarkers, and polylines applications page showing how to add boxes to a map using different methods. Added example 11 to the legend applications page showing how to create a legend based on resources set for an XY plot. Example 11 was added on the unique applications page to show how to draw a series of attached XY plots, with polygons added for emphasis. This example was contributed by Dr. Xiaofeng Li. A new page that describes NCL function codes was added. Example 9 was added to the masking applications page showing how to mask a data array based on a lat/lon polygon. Example 5 was added to the table applications page showing how to create a monthly calendar. A new page on contouring ISCCP grids was added. Added an editor enhancement file for TextMate, contributed by Ryan Pavlick from the Max Planck Institute for Biogeochemistry. Added example 4 to the table applications page showing how to draw a table with tickmarks and labels. A new time axis labels page was added showing how to create nice time labels on the X or Y axis of an NCL graphic. Added a page showing how to fill a grid with interpolated values in locations that contain missing values. Added a page showing how to use various regridding functions in NCL. Added a page showing how to use NCL functions to put one-dimensional X,Y,Z data on a grid. Added a page showing how to contour random X,Y,Z data. Added a page showing how to plot categorical data. Added a page showing how to plot radar (r, theta) data. Added example 12 to the polygons, polymarkers, and polylines applications page showing how to layer various primitives to get a particular effect. Added example 3 to the 2D vertical coordinates page showing how to shade the area below a terrain-following plot. Added example to the annotations page showing how to attach a legend to a map. Added a page showing how to draw pie charts. Added a page showing how to do plot annotations. Example 16 was added to the histogram page showing how to label the histogram bars with values from the histogram itself. Example 6 was added to the ICON model data page showing how to overlay two high-resolution fields onto a coarse global field. Example 28 was added to the XY plot page showing how to create a hodograph plot. Example 11 was added to the bar chart page showing how to panel a plot with multiple bar charts and add a custom legend. HDF-SDS example 5 was added to the HDF applications page showing how to draw multiple swaths on a single map. Example 8 was added to the map tickmarks page showing how to change the labels of the X and Y axes of a cylindrical equidistant map. Example 15 was added to the histogram applications page showing how to change the labels on the X axis. Added a page showing how to do overlays, which is what allows you to draw contours, vectors, streamlines, and XY plots on top of other plots (like maps). Added a page showing how to plot ICON model data. Alan Norton of NCAR added a page showing how to use NCL with VAPOR to analyze WRF-ARW data in 3D. Example 3 was added to the shapefiles applications page showing how to plot stream data from South America. Added a page showing how to control the draw order of various plot elements. Visualizing various kinds of HDF datasets. Visualizing high resolution precipitation datasets. Binning data from satellite swath data. Example 3 was added to the native applications page showing how to retrieve lat/lon coordinates for a data array when all you have are map projection parameters. Example 24 was added to the panel applications page showing how to control the resize scale factor for paneled plots that are different sizes. 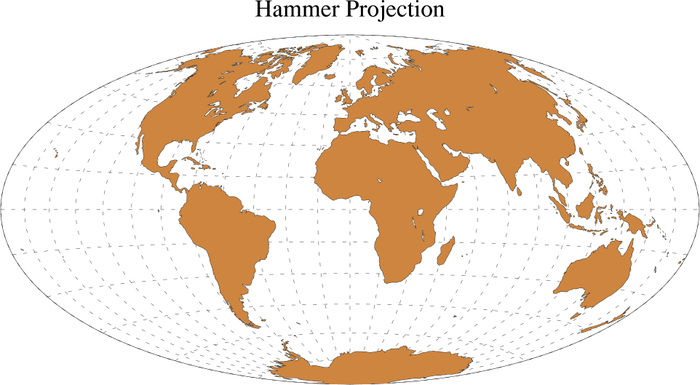 Example 23 was added to the maponly applications page showing how to draw all the current map projections for V5.1.x. Example 9 on the text applications page was supplemented to show how to attached rotated text strings. Example 10 was added to the contour-on-contour applications page showing how to plot precipitation over terrain data. A new applications page was created for the various editor enhancement scripts that have been contributed by users over the years. These scripts are not brand new; they were previously hosted under the "Support" page. Example 4 was added to the Station Data applications page showing how to plot all METAR reporting stations for a specified region. This script was contributed by Jonathan Vigh of Colorado State University. A new applications page was created to demonstrate the difference between an NCL viewport and bounding box. Example 8 was added to the masking applications page showing how to draw all the counties of a particular state and mask all other areas. A new applications page was created to show how to create animations in NCL. A new applications page was created to show how to read and plot shapefile data. Note that this is only available in V5.1.1 or later, and in V5.1.1, it's a beta test version only. Example 23 was added to the panel applications page illustrating how to panel 12 plots that are attached along the X and Y axes. A new applications page was created to show some vector effects, like filling and outlining vectors, and controlling the look of vector arrow heads. Example 26 was added to show another way of adding a curve to an existing XY plot. Example 27 was added to show how to generate an XY plot with four curves and four separate Y axes. Example 8 was modified on the maponly applications page to show how to draw only those countries/boundaries that are specified via the mpOutlineSpecifiers resource. In this example various countries in southeastern Asia were drawn, along with the Chinese provinces. Example 10 was added on the unique applications page to show how to draw a series of attached XY plots, with gray bars added for emphasis. This example was contributed by Yi Wang of PNNL. Example 25 was added on the XY page to show how to add data to an existing XY plot. Example 14 on the contour effects page was added to show how to overlay shaded contours on color-filled contours, and generate two separate labelbars. Example 7 was added to the masking applications page showing how to color fill and then outline areas of missing data in a contour plot. This method could be used to mask and then fill all areas on a height by latitude (or longitude or time) plot that are below ground assuming one has topographic information. Example 24 was added to the XY page to show how to fill between two Y curves using new resources gsnXYFillColors or gsnXYAboveFillColors/gsnXYBelowFillColors. Available in version 5.1.0 and later. Example 19 was added to the maps only applications page showing how to draw some of the Antarctica ice shelves. A new applications page was created to show how to modify the axes of XY, contour, and vector plots. Examples 17 and 18 were added to the maps only applications page. 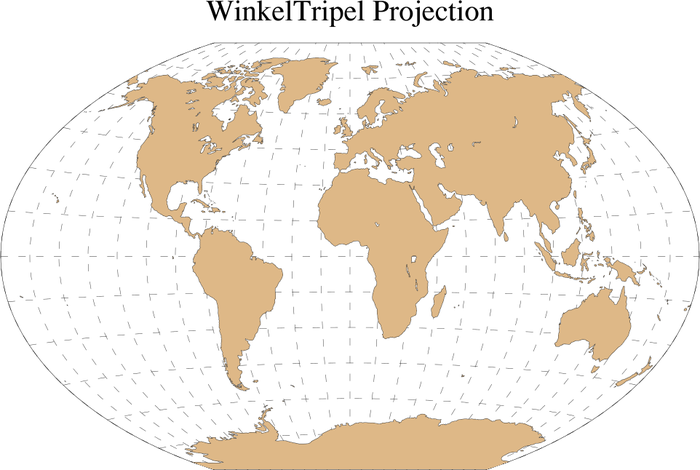 Example 17 shows three new map projections added: Hammer, Aitoff, and Winkel tripel. 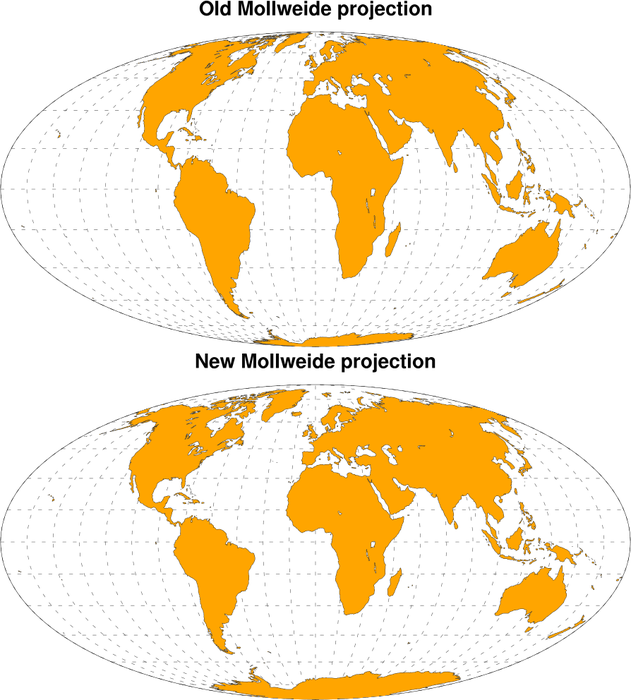 Example 18 compares the old Mollweide projection with a new one that uses more accurate calculations. Example 16 was added to the maps only applications page showing how to use a new map database for drawing province and state boundaries in China, India, and Brazil. A color maps applications page was added. A T-S diagram applications page was added. Example 13 was added to the text applications page showing how to change the justification of your text strings. Example 9 was added to the legend applications page showing how to change the order of items in a legend. Example 9 was added to the contour-on-contour applications page showing how to overlay domains of different resolution. Example 13 was added to the histogram applications page demonstrating how to change the formatting of the bottom axis labels. An applications page for dealing with GrADS CTL files was added. This page provides a ruby script for parsing such files. Thanks go to Saji N. Hameed of the APEC Climate Center for this contribution. 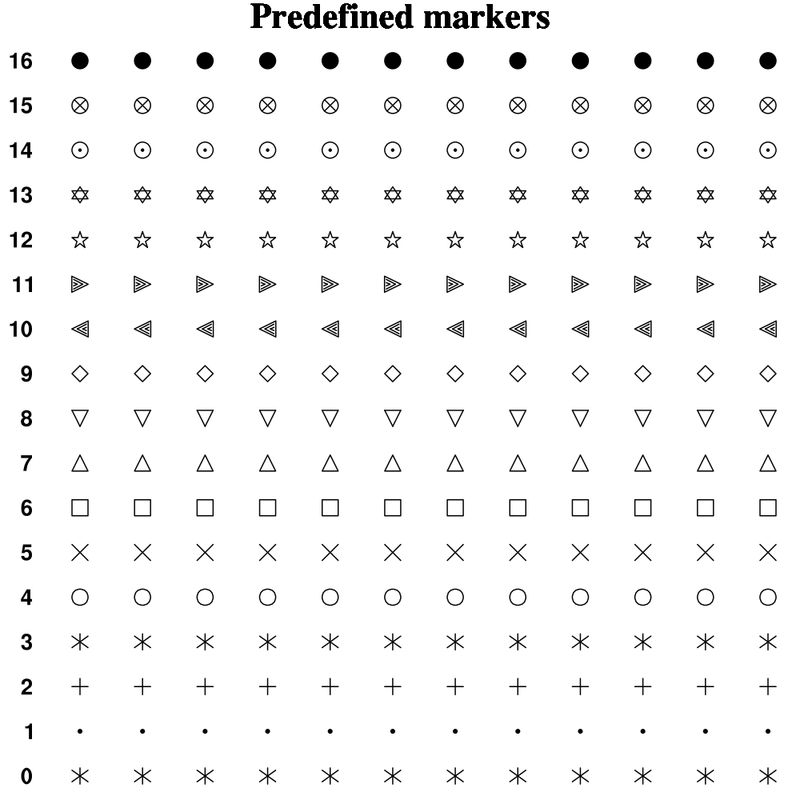 Examples 10 and 11 were added to the tickmarks applications page illustrating how to label both major and minor tickmarks. They both use a different method. Example 11 introduces a new function called gsn_blank_plot. Example 8 was added to the weather symbols applications page showing how to draw vectors with an informational label box using wmvect and wmvlbl. Example 9 was added to the weather symbols applications page showing how to draw vectors over a map with an informational label box using wmvectmap and wmvlbl. Example 22 was added to the panel applications page illustrating how to add individual common titles to two sets of plots paneled on the same page. Example 21 was added to the panel applications page illustrating how to add common X/Y axis labels to a panel plot. Examples 11 and 12 were added to the text applications page showing how to add a label on the right Y axis, and how to add subtitles to the top of a plot. An Evans plots applications page was added to show how to generate the special Evans plot, which is a way to visualize spatially two variables of interest, one of which provides some measure of "importance". Example 12 was added to the labelbar applications page illustrating how to control the end labels and boxes on a contour labelbar. Example 6 was added to the three-dimensional graphics applications page illustrating how to draw curves with arrowheads. Example 7 was added to the weather symbols applications page illustrating how to draw custom arrows. Example 15 was added to the maps only applications page illustrating how to draw climate divisions. Example 20 was added to the panel applications page illustrating how to panel plots of different sizes. Example 6 was added to the weather symbols applications page illustrating plotting station model data over a map using wmstnm. Example 18 was added to the Color Fill applications page to illustrate colors in the HSV color space. A boxplot example was added that shows how to calculate and plot the median, minimum value, maximum value, and the 25th and 75th percentiles of two timeseries. An example was added to the mask applications page that shows how to use landsea_mask to calculate a land sea mask for a particular grid, and how to apply the calculated land sea mask to a data array. An applications page was added showing how to generate contours from an EASE grid. Example 5 was added to the weather symbols applications page showing how to panel plots that use calls to wmbarb, wmbarbmap, and wmstnm. A 3D plot applications page was added to show how some low-level routines can be called from NCL to generate 3D scatter, surface, and isosurface plots. Example 22 on the XY page was added to show how to shift the left Y axis away from the rest of the plot. A Example 9 on the tick mark page was added to show how to place and label the righthand side Y-axis tick marks differently than the lefthand side Y-axis tickmarks. A TIGGE project applications page was added to show how NCL could be used to handle and display the TIGGE project data. Example 21 on the XY page was added to show how to use reference lines and fill colors to achieve a special kind of filling of your XY plot. Example 13 on the contour effects page was updated to show how to use the new gsn_contour_shade function. Example 19 on the XY page was updated to show how to add a legend to a plot with three different Y axes. Example 19 was added to the panel applications page to show how to use the new resources gsnPanelXF, gsnPanelYF, and gsnPanelDebug. A new table applications page was added showing how to use the new gsn_table procedure. The Taylor Diagram applications page was significantly overhauled to add some new examples, and to reflect some of the updates made to the code. A new ASCII-reading page was added to show how to read columnar data that is separated by a common delimiter. Example 9 was added to the unique applications page showing how to create a topographic map using raster contours. Example 12 was added to the histogram applications page showing how to annotate each individual bar. Example 11 was added to the polygons, polymarkers, and polylines applications page showing how to draw the political divisions of Brazil. A new WRF page was added showing how to generate storm track plots from WRF data. Two more unique application examples were added (examples 7 and 8). One is an animation that shows a simulation of an idealized vortex evolution on the sphere, and the other is a storm track of Hurricane Katrina. A new page has been created to show how to contour the ARPEGE grid. A legend example was added (example 8) to show how to use the new gsn_create_legend function. An example was updated to show how to use a new resource called mpMaskOutlineSpecifiers to mask outlines in a map that you don't want to see. This is useful if you need to create "simplified" continental outlines (that is, outlines without small islands and inland water areas included). See example 14 in the map only section. A new example has been created to show how to use gsn_create_text and gsn_add_annotation to create text and attach and position it on a plot. See example 9 in the text section. A new example has been created to show how to draw simple continental outlines that don't include inland water or island outlines. See example 14 in the map only section. Example 12 was added to demonstrate how to color fill/pattern fill/outline areas with missing values. Example 2 was added to the time applications page showing how to use ut_calendar / ut_inv_calendar to go from a mixed Julian/Gregorian date to a UT-referenced date, and then back again. Example 3 was added to highlight the functionality of yyyymm_to_yyyyfrac, which can be used to set up a monthly time array useful for plotting purposes. Example 9 was added to the polygons, polymarkers, and polylines applications page showing how to draw the meteorological subdivisions of India. Example 4 was added to the wind barb applications page showing how to produce a wind profile plot using gsn_csm_vector_scalar. Example 20 was added to the XY applications page showing how to use gsn_csm_x2y2 to plot curves with multiple X and Y axes. A new page on visualizing NARR (North American Regional Reanalysis) data was added. Two new examples were added to the paneled plots page (examples 17 and 18). One shows how to panel plots that have two separate labelbars, and the other shows how a labelbar doesn't explicitly need colors in the middle. Example 6 was added to the unique examples to show a visualization with ten XY plots and a legend at the bottom. A new polymarker example was added (example 8) showing how to use markers of different colors and sizes at station locations. A new example was added to the tickmarks page (example 8) to show even more ways of formatting tickmark labels. New examples have been added to the legends (example 7) and station data (example 2) applications pages. These examples are very similar: they show how to plot station data by grouping the values by their ranges, and then using a unique marker color and size for each range. Two new applications page were created to show how to draw various weather symbols and how NCL can interact with the UNIX system command line. A new applications page has been created to show how to read in station data and generate visualizations of it. Three new examples have been added to the titles applications page. Of note is example 7, which shows how to modify the position of the gsnLeftString, gsnCenterString, and gsnRightString text strings. Also, example 8 shows how to switch the locations of the tiXAxisString and tiYAxisString. A new applications page has been created to show off some of the unique visualizations created by outside users who use NCL. A new example (#11) has been added to the histogram applications page to show how to use the new gsnHistogramBarWidthPercent resource, which allows you to set the width of the bars based on a percentage of the bin width. A new example has been created in the mask applications page to show how to draw filled contours only over Africa, while filling the land and oceans everywhere else. A new page has been created to show how you can contour triangular meshes. A new page has been created to show the various ways that you can control the appearance of tickmarks. Of special interest is example 4 which demonstrates how to change the formatting and precision of tickmark labels. A new example has been created to show how to generate US counties. See example 10 in the map only section. A new page has been created to show how to contour the ORCA grid, and also, subsequently, how to do cell mode contour fill and outline the individual cells. 2D vertical coords example 2 - shows how to do contour cell fill and outline the underlying data grid. XY example 19 - shows how to use the new gsn_csm_xy3 function. Contouring non-uniform grids example page. Example (color_17) demonstrates how to use gsn_draw_named_colors to draw a list of named colors (useful for debugging purposes). The long lag in adding new NCL examples had been due to our efforts in creating the new website. Contour Effects example page: Many of the examples on this page have been updated to reflect new resources that have replaced shea_util functions for contour effects. example (xy_7) has been updated to reflect the addition of gsn_csm_xy2. example (color_16) demonstrates how to retrieve the RBG values of an assigned colormap. example (conLab_6) demonstrates how easy it is to adjust contour labels. example (panel_16) demonstrates how to shrink a panel plot down to one column for ease in publication. example (xy_9) demonstrates how to draw the Mexican states. example (maponly_8) demonstrates how to draw only certain portions of the continental outline when there is no map fill. example(xy_11) has been modified to demonstrate how to change the precision of the tick mark labels on the YR axis. example (eosdis_5) demonstrates the use of dim_gbits. example (bar_6) and (bar_8) have been respectively modified to demonstrate the new resources gsnXYBarChartColors2 and gsnXYBarChartPatterns2. example (resize_7) demonstrates how to maximize a plot created with viewport specifications. lambert conformal native grid example page. example (color_3) has been redone to demonstrate how to fill a contour with a transparent or no color. example (histo_10) demonstrates overlaying multiple histograms on top of each other. example (xy_15) demonstrates how to draw inward facing tickmarks. example (xy_17) demonstrates how to manually add a legend and text to an xy plot. example (text_7) demonstrates how to put a degree symbol into a string. Masked Lambert Conformal Projection example page. example (conLab_5) (popscal_1) demonstrates a new label density resource. example (conOncon_8) is a color significance plot. Zonal Average example page. This was a consolidation of the 1D and 2D zonal average pages. XY plot example page. This preplaces the older line example page. example (lat2pop_2) demonstrates how to remap lat/lon vectors to the POP grid. example (xy_3) demonstrates how to create your own xy dash pattern using the new function NhlNewDashPattern. example (xy_4) demonstrates how to create your own xy marker style using the new function NhlNewMarker. example (h_time_5) demonstrates how to remove the height label from a pressure height plot. example (conLab_4) demonstrates how to create a white background box around a contour line label. example (native_3) demonstrates how to create a native stereographic projection from an ASCII file. Draw the POP Grid example page. Native Grid example page has been updated so that all scripts call gsn_csm templates. This removes the necessity of creating label bars and separate titles. Regional Climate Model example page has been updated so that all scripts call gsn_csm templates. This removes the necessity of creating label bars and separate titles. lat/lon 2 POP example page. example (conOncon_7) demonstrates how to draw a spaghetti plot with data that has 2D lat/lon coordinates. example (color_15) demonstrates symMinMaxPlt that automatically created a symmetric min/max/int for use with symmetric color tables. eos dis example page has been updated to take advantage of the 2D coordinate plotting capability available since NCL version 4.2.0.a025. There was a bug in this capability that prevented it from working. This was fixed in NCL version 4.2.0.a028. example (panel_1) demonstrates creating a panel plot with two manually placed plots. example (histo_9) demonstrates how to draw a histogram on top of a map.